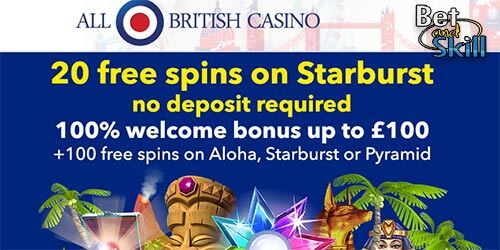 Get 20 No Deposit Free Spins on Starburst slot when you register a new account at All British Casino via this page - PLUS 100 Extra Spins (on Starburst, Pyramid or Aloha) and a 100% Match Bonus on deposit up to £100! Are you looking for No Deposit Free Spins without deposit? You are at right place! 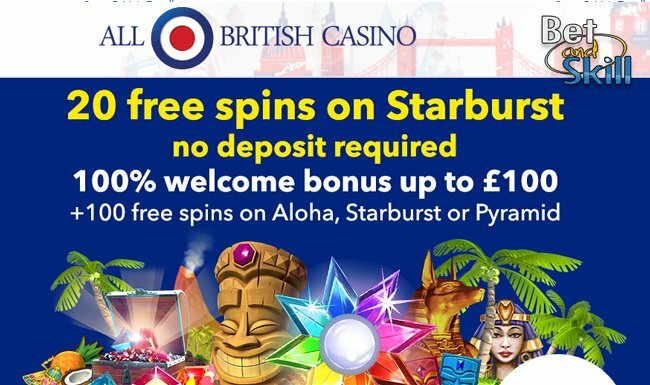 All British Casino is offering 20 free spins on registration to use on Starburst, the most popular online slot! Start playing without deposit a single cent! How to get your 20 no deposit free spins at All British Casino! 2. Register your account at All British Casino via this special link. 3. Play your 20 free spins on Starburst with no deposit required! All British Casino is established as a transparent operator that promises its players a safe and secure service and it is licensed and regulated by the UK Gambling Commission under licence number: (000 038758 R-319451 001) for customers who reside in the United Kingdom. Although All British Casino trumpets itself as a British casino, they do accept players from many different countries. The games selection is very nice, with Net Entertainment's full selection of slots available, including all of the games with massive pooled progressive jackpots such as Mega Fortune, Hall of Gods, and Arabian Nights. All bonuses have a wagering requirement of 35x the received bonus unless otherwise communicated. All bonuses have a 30 day validity period in which it must be cleared. Players are allowed to make new deposits on top of their existing bonus to help meet the wagering requirements. Bonuses are not available in the live casino at All British Casino. Winnings from free spins is credited as a bonus. The bonus must be wagered 35x before players can withdrawal winnings or transfer money to the live casino. The bonus won by free spins is valid for 48 hours to allow the wagering requirements to be met. Min. withdraw: £40. Max withdraw £100. "All British Casino 20 No Deposit Free Spins on Starburst"